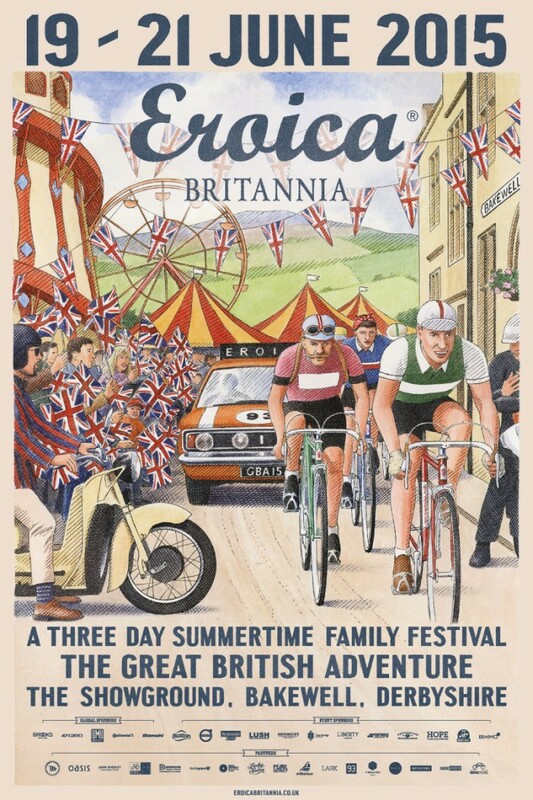 There’s still time to hop across the pond and participate in this year’s Eroica Britannia. Welcome to The Great British Adventure! Each route has been created by us in partnership with The Peak District National Park Authority, using their wisdom and love of their region to give you the best of this majestical part of Britannia. We’re going to be adding download links for each route so you can view in more detail – so keep checking back! All adventures start in Bakewell on the banks of the spectacular River Wye! We then head onto the Monsal Trail! The Monsal Trail tunnels offers one of the most spectacular leisure routes in Britain for cycling. For most of it’s length the trail follows the course of the Old Midland Railway line (closed since 1968) through the heart of the Peak National Park and follows the valley of the River Wye. The Trail route takes all riders through the beautiful locations of Hassop, Great Longstone, Monsal Dale and Cressbrook. At Millers Dale all riders leave the trail and begin to head in different directions depending on the chosen adventure. A great choice for riders of all levels of fitness. It is fairly undulating but definitely enough of a stretch to give you a challenge. This ride is all about the spectacular views from Monsal Head and Great Hucklow where you will enjoy classic panoramic views in their full glory! Along the way you will have plenty of time to enjoy the hospitality of the charming Tideswell Village (one of the most ancient settlements in the central Peak District and was granted a charter for a market in 1251). You’ll also pass through Eyam one of the best-preserved villages in the vicinity and is the famous ‘plague village’. We recommend that you stop and enjoy both villages and re-charge on local delights before setting off on the day’s major challenge the climb up to Monsal Head. Monsal Head stands high above the dale, offers the best viewpoint for admiring the horse shoe shaped valley of Monsal Dale. At this point you’ll be pleased to know that you have a gradual descent towards finally arriving at Bakewell and your bottle of Eroica Britannia beer and the finish line! A bit more adventurous and does require you to be reasonably fit as there is a 6 mile undulating climb out of Millers Dale before beginning the “white road” which is that start of the High Peak trail. The High Peak Trail follows the route of the former Cromford and High Peak Railway. This was one of the world’s first long-distance railway lines, built between 1825-30. Many important railway buildings and features can still be seen, including High Peak Junction Workshops, Middleton Top Engine House, Hopton Tunnel and Hopton Incline. Along this route a real treat is in store with a major food and refreshment stop taking place in Hartington Village. Hartington is a prosperous looking village standing at the northern end of the Dove Valley and still has the air of a bustling market town, although it is many years since a market was last held in its spacious Market Place. The classical three-arched façade of the Town Hall, built in 1836, adds to this urban impression, and the Market Place is ringed by elegant 18th and 19th century stone cottages and inns. Its also home to the famous Stilton Cheese!! After filling up on Hartington treats you will head out uphill toward the next section of “white roads” before joining the Tissington Trail. Part of the London and North-Western railway which opened its line between Buxton and Ashbourne in 1899 and closed it in 1966. The line was purchased by the Peak National Park and Derbyshire County Council in 1971 and reopened as the Tissington Trail. The trail ends with a 3 mile descent to Cromford. Cromford is well known through its connection with Sir Richard Arkwright, who established a water powered cotton spinning mill here in 1771. Cromford is set in a valley, surrounded by wooded hills and cliffs, bordered by the River Derwent to the east and vast quarries to the west. On reaching Cromford you cross the River Derwent via a bridge and head uphill towards Beeley Lane and Beeley. From here we turn towards Chatsworth House stately Home and grounds where you will enjoy an exclusive route right through the grounds of Chatsworth House for a refreshment stop in its unique surroundings voted the Nation’s favourite stately home. The seat of the Duke of Devonshire, and home to the Cavendish family since 1549, Chatsworth House sits close to the River Derwent in 1,000 acres of parkland here you will be able to relax and enjoy its wonderful setting. The finish is just round the corner from the Festival grounds where a bottle of specially brewed Eroica Britannia Beer waits for you! A real challenge but it covers all the very best of the Peak District National Park. After the exit from the Monsal Trail (at Millers Dale) you will head for a hearty breakfast at Tideswell Village and head towards the Hope Valley and Edale Valley. On leaving Edale Village you come across the first very major climb the dramatic Mam Nick and 2miles at 15% gradient at times. The effort is well worth it as the views down the Edale Valley are stupendous. The route heads downhill to the biggest urban cycle route of the day through the town of Chapel en le Frith “The Capital of the Peak District” established by the Normans of the 12th Century. As you leave Chapel en le Frith behind you soon turn towards the delights of the Goyt Valley. The Goyt Valley combines some of the most picturesque valley, moorland, river and reservoir scenery to be found in the United Kingdom. After a welcome refreshment stop you head towards the beginning of the Tissington Trail and head towards a mix of trails and tarmac country roads before arriving for a welcome food stop break at Hartington Village. After the break you will head towards the picturesque English village of Ilam (eye-lamb) nestling beside the River Manifold in the Staffordshire Peak District among spectacular hills. It has Alpine style cottages, a mansion and an eccentric river and is set against the soft green backdrop of Bunster Hill, Thorpe Cloud and the steep and tumbling pastures. Ilam is a village with a long history the perfect place for you to soak up the atmosphere with a quintessentially English tea and cake stop. You rejoin the Tissington Trail followed by skirting alongside Carsington waters where you join the last of the 3 trails – The High Peak Trail to Cromford. On reaching Cromford you cross the River Derwent via a bridge and head uphill towards Beeley Lane and Beeley. From here we turn towards Chatsworth House stately Home and grounds where you will enjoy an exclusive cycle route right through the grounds of Chatsworth House for a welcome refreshment stop in its unique surroundings voted the Nation’s favourite stately home.The seat of the Duke of Devonshire, and home to the Cavendish family since 1549, Chatsworth House sits close to the River Derwent in 1,000 acres of parkland here you will be able to relax and enjoy its wonderful setting. The finish is just round the corner! Hurray! Your Eroica Britannia Beer awaits!